Helping you find your space. Our inventory of storage space is impressive - over 600,000 square feet. But more attractive is our ability to customize. We can create expansive floor spaces or design more limited, cost-effective pockets of space. Whatever's right for your budget and your needs, whether it's cold storage, raw material storage, whatever imaginable form of storage you might require. 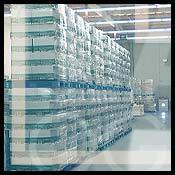 Within the many walls of Leach Logistics are racking facilities, bulk storage sites, and public warehousing. We'll work with you to locate the square footage that's suited to your needs as well as your ambitions. And where inventory control and monitoring are concerned, we excel. Our Maves Warehousing System Software is seamless and state-of-the-art, always keeping us abreast of product inventory and activity.